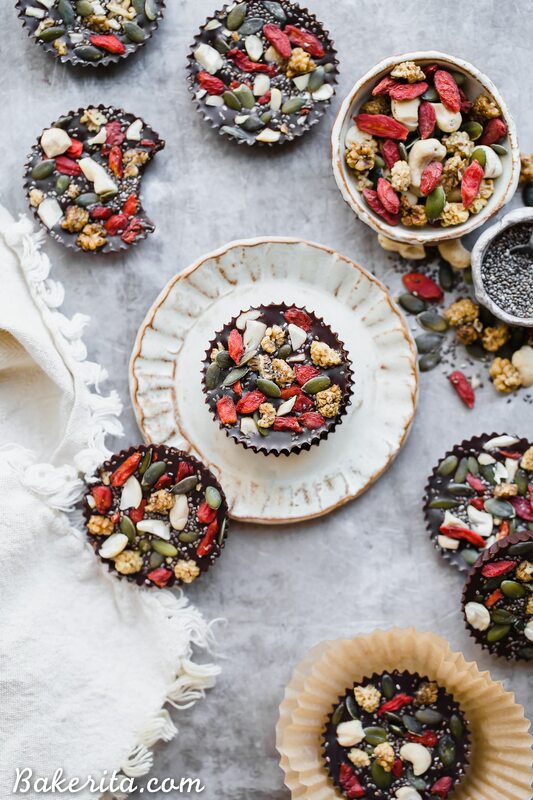 1000These Superfood Cacao Fudge Bites are creamy, so rich in cacao flavor, and topped with all sorts of delicious superfoods, like cashews, goji berries, chia seeds, and more. They’ll satisfy your candy craving and they’re gluten-free, paleo, and vegan! This post is sponsored by Sunfood. I turned 25 this past Sunday. WILD! I had lots of feels about it – from being so weirded out that I’m TWENTY FIVE and have been running this blog for over a third of my life, to being so dang proud of myself for what I’ve accomplished over the past 25 years, and how much I’ve grown and changed as a human. I did a whole Instagram post about it that you can read here if you’re interested. The main point, though, is that I’m proud. I’m proud of my accomplishments and who I am as a person. I’ve put a lot of time, energy, and love into myself to get to this place. It can be hard to be proud of ourselves, especially when society tells us we should get to a certain place before we’re allowed to proud of ourselves. We should be married, or have this amount of money, or have gotten this certain job. But that’s pointless – we should be proud of ourselves every damn day. For waking up, for being a kind person, for sharing our love and passion with the world. We all deserve to be proud of ourselves, and I am proud of you for just being you. I’m full of mushy feelings today, and so incredibly grateful for my life and the community I am surrounded with and supported by. My family, my friends, and you all are truly the greatest gift a girl could ask for. 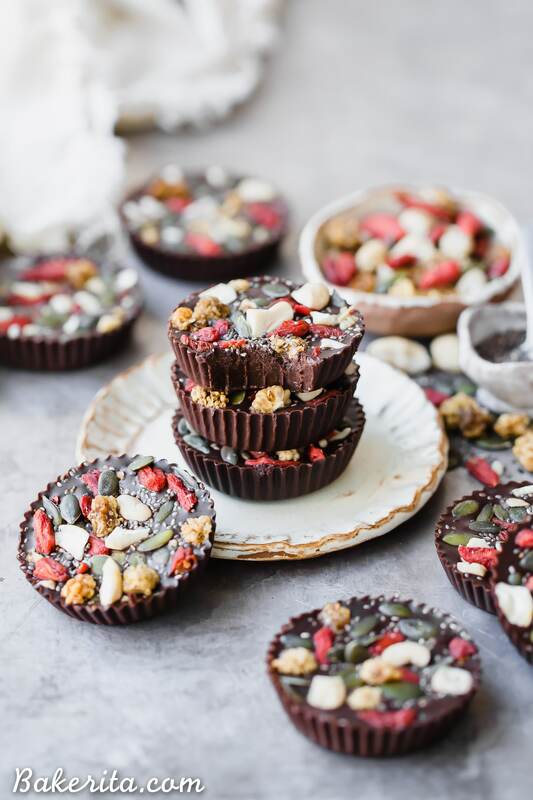 These Superfood Cacao Chocolate Bites are a close second to that gift, though (smooth transition, eh ). 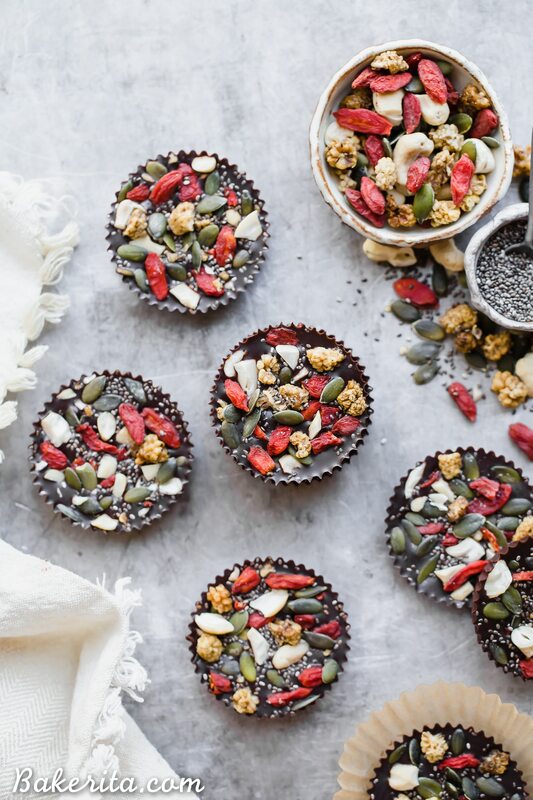 They’re loaded with good-for-you superfood goodies and made with all sorts of antioxidants and healthy fats, but even better than that is how dang delicious they are. The fudge made is made with just four ingredients: cacao powder, cacao butter, almond butter, and maple syrup. The cacao butter and cacao powder are both from Sunfood, one of my favorite brands. Besides being a local San Diego company (which I always love), their products are consistently the highest quality – always organic, gluten-free, vegan, and raw when possible. The fudge comes together so quickly – just melting down the cacao butter, and stirring everything else in. That’s all. The fudge mixture is then divided between muffin cups (or poured into a small pan, if you prefer). Then, all the superfood toppings are added on top! I opted for more Sunfood superfood goodies for the toppings, but you can be flexible with these and use what you’ve got on hand/whatever strikes your fancy. I went with Sunfood’s goji berries, cashews, white mulberries, chia seeds, and pepitas. HECK ya – such a good combo of flavors and textures that make these incredibly delicious. 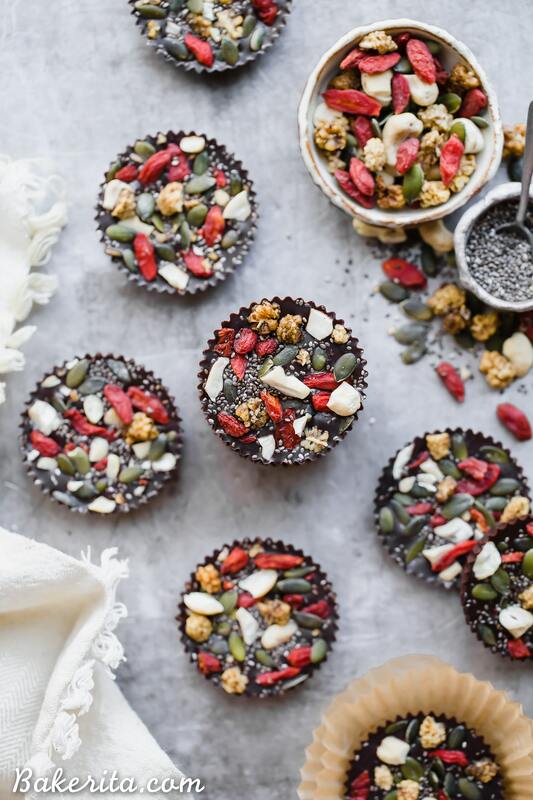 These Superfood Cacao Fudge Bites are creamy, so rich in chocolatey flavor, and topped with all sorts of delicious superfoods, like cashews, goji berries, chia seeds, and more. They'll satisfy your candy craving and they're gluten-free, paleo, and vegan! Place the cacao butter in a liquid measuring cup and melt in 20 second increments, stirring between each, until fully melted. It can also be melted over a double boiler. Add the cacao powder, almond butter, maple syrup, and pink salt and whisk to combine. Pour the chocolate into a small baking dish or divide between 12 muffin tin cavities (use silicone or lined with muffin liners). 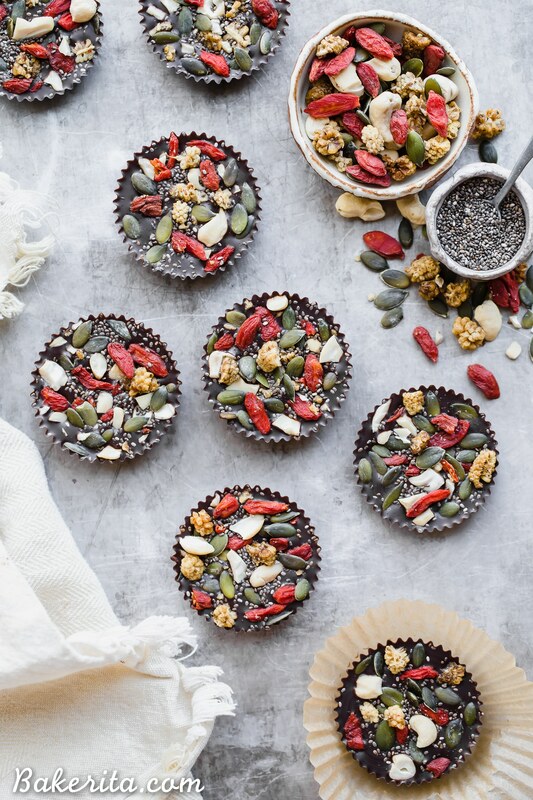 Sprinkle the goji berries, cashews, mulberries, pumpkin seeds, and chia seeds evenly over the top of the chocolate. 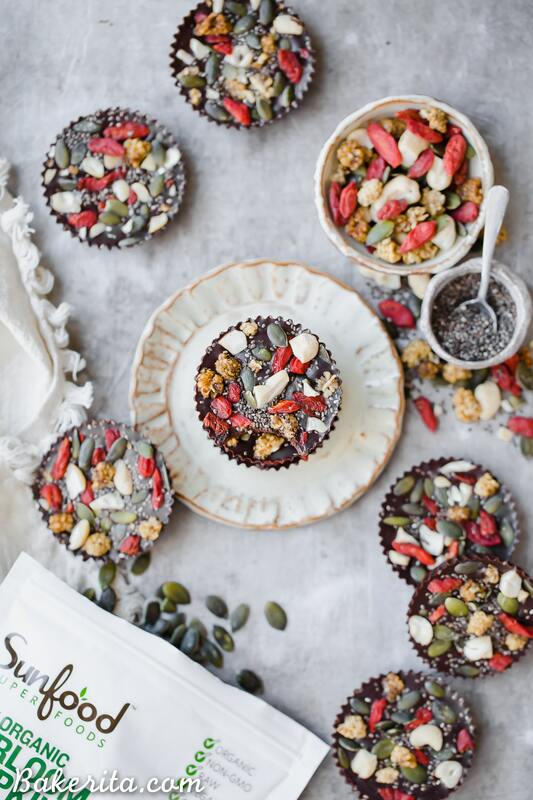 Place in the refrigerator for about an hour to firm up the superfood chocolate. Store in the refrigerator or at cool room temperature. Would you know about how many calories on these amazing creations? Hi Crystal, I just updated the recipe to include nutritional info. They’re 169 calories per cup! Per cup means per bites? Thankyou! Yes, that’s what it means as you can see via the nutrition panel (they’re made in cupcake cups which is why I referred to them as cups). Do you have a particular almond butter you prefer? Thanks! Any almond butter that’s made with just almonds! :) I like Spread the Love or Whole Foods brand. Are they 169 calories with or without the toppings?